Pennsylvania’s rare species are under attack. The deceptively named “Endangered Species Coordination Act” (HB 1576 and its Senate companion, SB 1047) would gut the ability of our state natural resource agencies to list and protect rare plants and animals; essentially only those species listed by the federal government would be covered. 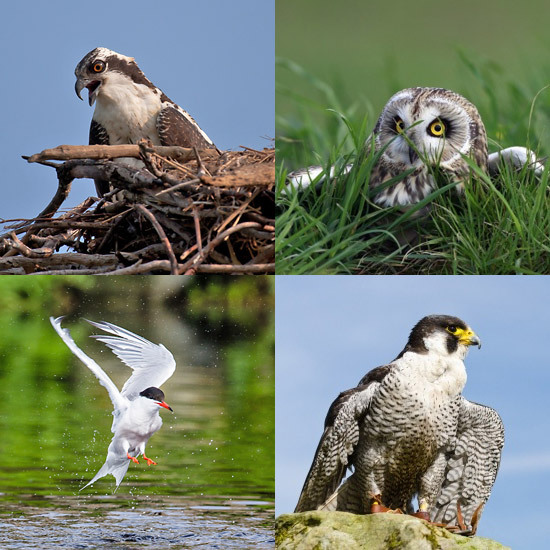 Osprey, Short-eared Owl, Peregrine Falcon, and Common Tern (clockwise from top-left) are just a few of the bird species in Pennsylvania threatened by this legislation. Result in PA losing $27 million in federal wildlife restoration funds, representing up to a third the budgets of the Game Commission and Fish and Boat Commission. This is money we get to help protect important habitat including pristine trout streams. Require any action to list a species as threatened or endangered to first go through the Independent Regulatory Review Commission (IRRC) for approval. The current process for listing a species is efficient, transparent, scientifically accurate, and takes only 6 months. The new proposed process would add an unnecessary and costly level of bureaucracy, taking 4 times as long to complete (2 years). In some cases, 2 years is too slow to save a species from extinction. Make it much more difficult to protect high-quality trout streams by requiring the designation of such streams to also go through the IRRC for approval. Pennsylvania’s trout streams are highly valued by residents in addition to being one of the core of recreational activities that benefits tourism in the state. Place further strain on state agencies already operating on reduced budgets by calling for the creation of a centralized database to replace the decades-old computerized system of endangered species and fauna, without designating the funds to establish such a database. Require the state natural resource agencies to provide a virtual roadmap to the location of species that are often targeted for illegal sale and trade (via the above-mentioned database). The legislation requires access to the centralized database to be shared with various outside entities. Insofar that many endangered and threatened species have substantial value on the black market, this will increase the risk of unlawful taking of these species. Please call or send an email directly to your state representatives stating your opposition to this legislation. Your state representatives depend on where you live. Follow the links below to find your legislators.